Take a look at the wide range of great products we offer and get protection for the things in life you love! Everything you need to manage your account, all in one place. 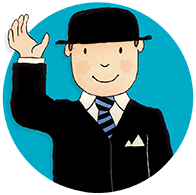 Making changes to your account needn’t be a hassle! Need any information from us? Get in touch, read our FAQs or find out more about The Insurance Emporium! We are The Insurance Emporium - a forward-thinking specialist insurance company with a myriad of insurance products such as pet, equine, wedding and many more. We strive to make ourselves bigger, better and constantly improve the services to our clients. If you offer products/services online, you can easily enhance your portfolio by joining our Affiliate Programme and displaying links to our products on your website. There is no cost to you and we will do all the work in creating these for you. For every policy that is taken out via your unique links, you will then receive commission, calculated at the end of each month and paid directly to you. It’s that straightforward. Why choose The Insurance Emporium as your affiliate provider? A dedicated team - We greatly value our relationship with affiliates and have created a dedicated Broker & Affiliate team who are here to help grow, service, support and develop both existing and new relationships. Commission rates - We could tell you how good we think our rates are, but that is for you to decide! Please contact us for further details. A fully interactive affiliate portal, allowing you complete control of your account with us. Improved commission payment facilities to accommodate BACS payment of your accounts. A thorough review of reporting/statement processes, to streamline and automate where possible and improve efficiency. Our on-going relationship review process is to be enhanced further by analysing your business volumes, commission levels and any appropriate offers or promotions tailored to your business needs. What insurance products do we offer through affiliates? I'm interested! What should I do? Error! All required fields must have valid information! 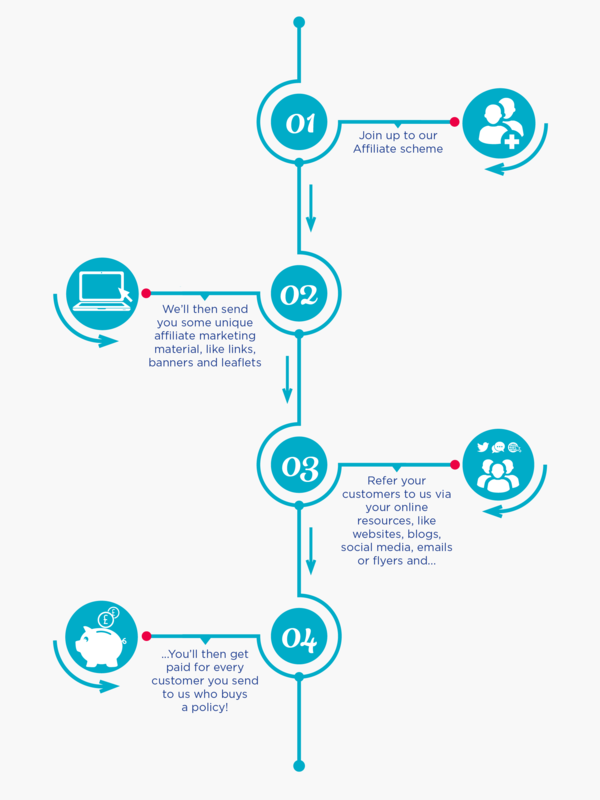 How does our affiliate programme work? When you join our affiliate programme, we will provide you with unique affiliate marketing material (links, banners, leaflets, etc.). Refer your customers to us via your online/offline resources (website, blog, social media, email, flyer, etc.). You will get paid for every customer you send to us who buys a policy. How do I join the affiliate programme? To register as an affiliate, simply complete the "Affiliate Enquiry" form online or contact our dedicated team on 03300 244 033 to discuss your requirements. We will issue a TOBA (Terms of Business Agreement) for you to complete and return to us. Once you are registered with us, you will receive a confirmation email detailing your unique affiliate number along with links & banners for you to place on your website. Our affiliate program is completely free to join. How often will I get paid? The commission due is calculated at the end of each month. You will receive a statement each month and payment is made by BACS. Do I need to generate a minimum amount of commission each month? There is no minimum business amount. No matter how small the amount of commission you generate, it will be sent to you by BACS the following business month. How do you track the business that is generated by my link? You will be allocated a unique URL which includes your affiliate reference number. This will enable us to track and identify each piece of business that comes from your website to our website, or that is received by post. The URL and affiliate reference number are used to identify any purchase the customer makes, for which you will then receive your commission. What are the products not available though your affiliate programme? All insurance products provided by The Insurance Emporium are available through the affiliate programme, with the exception of life, dental, home, income protection, travel and car insurance policies. Do I need to be registered with the FCA (Financial Conduct Authority) to become an affiliate? No. However, in line with FCA regulations, affiliates must not provide any advice to the customer. You must simply have the product information on display and introduce potential clients to us by way of leaflets, adverts or URL links. Magical pet protection for your furry friends! Hit the road on a caravan adventure! Cover for golfers of all handicaps! United Kingdom (registered in England and Wales no: 294940) which is authorised by the Prudential Regulation Authority and regulated by the Financial Conduct Authority and the Prudential Regulation Authority no: 202748. A lunar monthly policy runs for, and premiums are collected on, equal periods of 28 days. This type of policy renews every 28 days. Runs for 365 days from the commencement date and time shown on Your policy schedule; automatically renews annually.